The preamp is quite good for female voices, specially jazz singers. The compressor part has low noise but lacks a bit of the character from the original Urei units. Distortion: > 0.5% T.H.D. from 50 Hz – 15 kHz with limiting, at 1.1 seconds release setting. Output of +22 dBm with no greater than 0.5% T.H.D. Power Connector: Detachable IEC power cable. I have never regretted my purchase of any component listed. The 6176 is everything I hoped it would be as a signature link in my recording chain. Picked my first UA product up less than a month ago, I had been paying down on the Layaway balance for months.I would come to the store, have them pull the box out of the back, sing my preamp a song, wrote poems to it, bought it a steak. The usual infatuation and blush. Yadda yadda. Thoroughly enjoying this latest addition to my humble recording setup now, and can hardly wait to lure prospective artists to perform for it. In other words, having a blast. If you've had trouble in the past discerning the differences in your microphones, the 6176 will put all ambiguities to rest. The nuances of each mic stand out like a color for your sonic palette. This channel strip is an absolute solution for recording vocals, el. guitars, bass, etc. In my home studio the 6176 plays a key role when it comes to input signals. In combination with some of the UAD-2 power plug-ins (Manley MP, LA2A, etc. ), this channel strip provides amazing results! A definite recommendation for future users. This Channel Strip is amazing! Its extremely versatile and sounds incredible. I was able to achieve any sound that I could think of just by tweaking the gain stage and the EQ. The EQ sounds really musical and even though the parameters are limited I couldn't ask for more during recording. What I also really like to do is use the preamp in a mixdown situation to give certain instruments (synths, samples...) that lack warmth, a little bit of life. 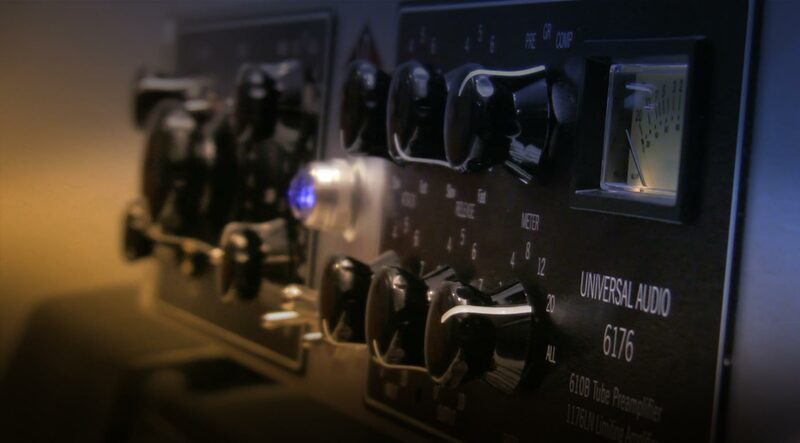 The 1176 style compressor sounds just like the 1176 only more transparent and a little more modern. I have used the original 1176 and I must say that I can't say which version I like better (6176 or 1176). Overall I have to say that this is the most impressive Unit that I have come across. I have tried a lot of preamps and channelstrips (Neve, SSL, Mindprint...) and eventhough Neve and SSL sound amazing the 6176 is a perfect combination of great sound and high usability. It will always have a spot in my rack! The 610 is a huge sounding pre. If not driven hard it is clean and sparkly, but crank it and it is easily pushed into a musical distortion. spend most of the time recording myself. This means that I end up having to set the sound using headphones and I have had quite a few mishaps. The good news is that most mistakes have been happy ones with distorted electric guitar being the only thing that doesnt take well to a bit of drive from the pre. The other problem I have had is that my vocal mic is an SE Gemini which is a valve driven beast that is much more suited to a cleaner pre as there is too much harmonic distortion going on with the 610. The tops become a bit out of control and I have to insert an EQ to calm it down. are not paying proper attention. Overall though I love it and have hopefully got another one on the way. and know the sound your looking for. I just couldn't find anything the preamp sounded good on. It's too slow, and boring. The EQ was a nice addition to the pre-amp. The compressor isn't a real 1176, and doesn't perform like one either. I sold mine after 3 months. Got hold of mine about a month ago as i wanted something to compliment my SSL Alpha channel which is ultra clean and has that classic SSL aggression, i was not disappointed! It sounds completely different to the SSL, even pushed hard it has a smoother distortion as expected and a less 'pinched' sound.... even gives rough vocals just thrown down with an sm57 that 'classy sheen'. the next level for my recording setup.. This is my second 6176, so that should say it all. I like this combination a lot. For guitar and vocals it gives me the silky sheen I was always looking for. a Brauner Phantera in addition. I also will try the 1176SA stereo link - just for the Colour of this channel strip (1176's) also on the 2Bus. Get one as early as possible it's worth ! Just got my 6176 today, using it on my project for acoustic guitar/vocals and I was truly blown away. For me the best sound is without the 1176LN but it is great you can split or join as you like and I will use the 1176 later as insert. Sweet that we can do so! The EQ section is just perfect for me, smart choice of frequencies. I need to get a second one for sure! Now I can hear so much more precise using my Focal Alpha 80 / Yamaha MSP 5 speaker combination. It is all about opinions, and for me that is my match! I like this channel very much because it brings a lot of possibilities to change the sound of voices (vocal, instruments) and it looks very good and makes joy. And it sounds great!